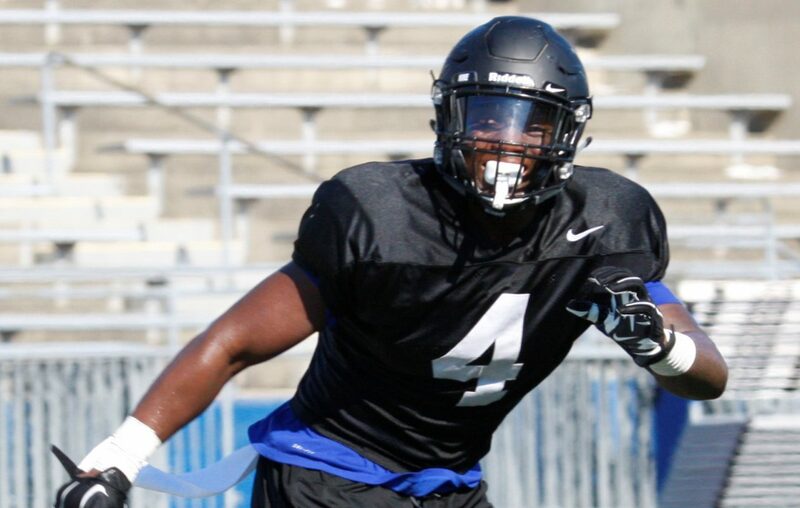 Former University at Buffalo linebacker Khalil Hodge has not received an invitation to the 2019 NFL Scouting Combine. “I actually didn’t get extended an invite,” Hodge told The News in a text message Thursday. Hodge said he was surprised not to get an invitation to the Combine, but plans to work out at UB's pro day on March 13. "It's all in God's plan, so I'm letting Him handle everything outside of my control," Hodge wrote. The NFL has not officially announced its list of draft-eligible players who have received invites to the Combine, which will take place Feb. 26 to March 4 in Indianapolis. However, players have been announcing their acceptance of those invites through various social media channels. Invites for the 2018 NFL Scouting Combine were announced Feb. 6, and 336 players were invited. On its website, www.nflcombine.net, the Combine says it notifies players selected to the combine “by January, 2019,” and that invitations are sent to players via email. National Football Scouting, which runs the combine, determines which players are invited through a committee with representatives from the NFS and BLESTO scouting services and members of NFL personnel departments, according to the combine website. UB wide receiver Anthony Johnson posted Wednesday on his Twitter account that he has received an invite to the combine, while UB confirmed Thursday that quarterback Tyree Jackson has also received an invitation. "I used to pray for times like this, truly blessed for the opportunity," Johnson said. NFL team personnel and scouts at the Combine will evaluate the nation’s top college players who are eligible for the NFL Draft. Draft hopefuls interview with personnel from NFL teams, participate in on-field workouts including the 40-yard dash, and undergo pre-draft medical testing. Not receiving an invite to the NFL Combine, however, doesn’t mean the end of the line for a player’s NFL hopes. For example, New England Patriots wide receiver Julian Edelman wasn’t invited to the 2009 combine out of Kent State, but was drafted by the Patriots in the seventh round and is in his 11th NFL season. DraftScout.com ranks the 6-foot-1, 255-pound Hodge as the No. 10 inside linebacker, and projects him as a sixth- or seventh-round pick. In its seven-round mock draft posted Tuesday, USA Today’s Draftwire.com had Hodge going to the Green Bay Packers in the third round of the draft, at No. 75. Hodge participated in the East-West Shrine Game on Jan. 19 in St. Petersburg, Fla., and registered one assisted tackle for the East in a 21-17 loss to the West. Hodge led the Bulls with 144 tackles, including 7.5 for losses, 2.5 sacks, one forced fumble and one interception in 14 games in 2018, and was named a fourth-team All-American by Phil Steele. Hodge finished his three seasons at UB with 421 tackles, registering at least 100 each season. He is completing his degree in sociology and training at EXOS in San Diego, in preparation for the NFL Draft. Hodge played at middle linebacker at UB, but worked out at weak-side linebacker during Shrine Game practices. Former UB players Branden Oliver, John Kling and Matt Weiser will play in the newly created Alliance of American Football. Oliver, a running back, will join the Salt Lake Stallions. He is UB's all-time leading rusher, and rushed for 773 yards and three touchdowns and added 409 receiving yards and a score in four seasons with the San Diego/Los Angeles Chargers. Kling, an offensive lineman, will join the Atlanta Legends. King was a second-team All-MAC selection in 2015 who signed as an undrafted free agent with the Chicago Bears and later was signed to the practice squad of the Washington Redskins. Weiser, a tight end, will join the Orlando Apollos. Weiser had 63 receptions, the most ever by a UB tight end, as a senior in 2015 and was an All-MAC First Team selection that year. The eight-team Alliance of American Football is made up of former NFL players who have been cut, former CFL players and undrafted college players. The 12-week season is scheduled to begin Feb. 9.